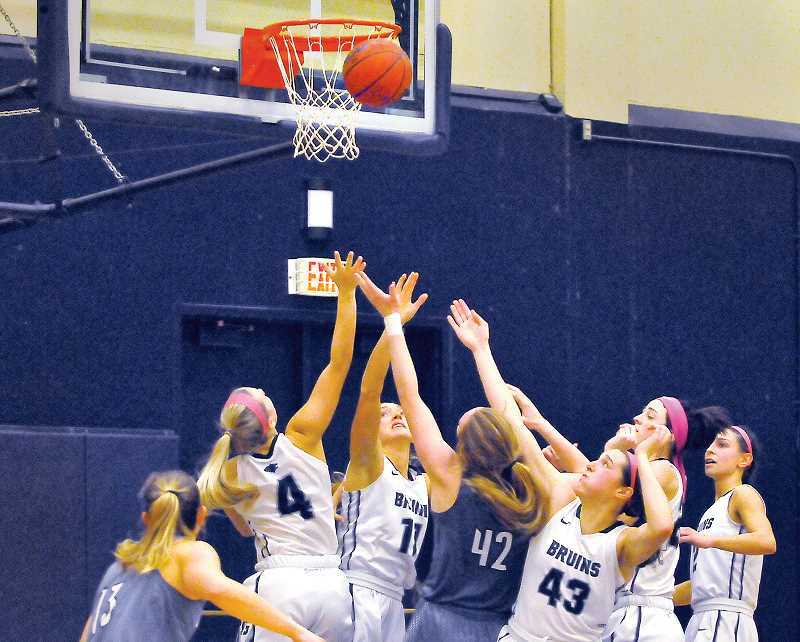 The George Fox women are in a tight race for the top spot in the Northwest Conference. The No. 14 Bruins (18-3, 11-1 NWC) are tied with No. 24 Whitman (17-4, 11-1) atop the conference standings. Despite a frustrating 19-point loss to the Blues on Jan. 12, the Bruins hold the tiebreaker – for now. A road game at Whitman looms on Friday. Before that, though, GFU picked up its sixth consecutive victory with a 64-40 win over Pacific Lutheran on Saturday. Coach Michael Meek's team hasn't lost since its admittedly disappointing performance against Whitman, and he said the Bruins are primed for a late-season run if they keep this up. "I like the way the kids keep coming together and improving," Meek said. "This has been a great group of workers and I think when you have that attitude you're only going to get better. We've still got a lot of work ahead." The game against PLU – played in front of an energetic home crowd at Taylor Court – began as an ugly back-and-forth affair with minimal offensive production. When GFU began forcing turnovers with regularity, however, the offense flowed. After one quarter, the Bruins led 19-4. At one point midway through the second quarter, it was 31-6. But GFU was sluggish during the final four minutes of the half and allowed the Lutes to crawl back within 16 at the break. Momentum appeared to be on PLU's side despite a lop-sided scoring line. Defense won the day for the Bruins, in the end. Even as its offense struggled through most of the third quarter, GFU held PLU to nine points in the third and 11 in the fourth. Those performances – combined with an outstanding first quarter on the defensive end – were enough to achieve a lop-sided victory. This Bruin team might not shoot the ball as well as some of its predecessors, but it thrives when it forces turnovers and gets consistent defensive pressure. Their length and athleticism on the defensive end is a legitimate asset – one that could win a few NCAA tournament games on its own. "We have been focusing a lot this year on ourselves and what we can control," junior point guard Emily Spencer said. "Every team in this league is going to bring their best effort every night and every team is talented." Turning defense into offense has been GFU's focus this season, according to Spencer, who put up nine points, seven assists and an eye-opening nine steals against the Lutes. 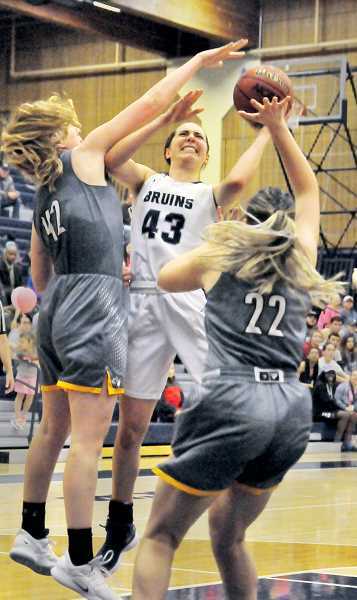 Senior forward Tavin Headings led the Bruins with 13 points off the bench, supplemented by 12 from sophomore point guard Madison Hull and seven points apiece from junior forwards Emily Holder and Haley Strowbridge. "Bringing the speed and playing tough defense really flows into the offensive side," Spencer said. "Bringing the energy all the time is something that allows us to be successful." Spencer is often the first one to inject energy into a game for GFU. Her tenacity on defense and patience on offense fit right into the mold of a collegiate point guard. She is directing traffic and calling out plays as often as she is diving on the floor for loose balls and making the ball handler uncomfortable. The team as a whole is comprised of players with a similar grit and toughness. Where GFU has struggled is finding consistent offensive production – particularly when it comes to outside shooting. Meek said he is happy with how his team played against PLU and also pointed to defense as a key factor in the Bruins' winning streak. With big games coming up, they're not quite where they want to be, but they're in a good spot. "We had great energy for 40 minutes," he said. "There's some lulls offensively that we've got to keep fixing, but when you work as hard as we did tonight, you can overcome those things." After Whitman on Friday, GFU plays at Whitworth on Saturday. The Bruins finish the regular season with a road game at Linfield on Tuesday and a home game against Willamette on Feb. 15. When the dust settles, the Northwest Conference tournament looms, and likely the NCAA Division III tournament after that.